Consider. Enact. Debrief. Experiment further. Effective processes that move groups forward often involve cycles of reflection, followed by action, leading to additional reflection, and so on. Alternating in this manner fosters engagement and integration, deepens experiential learning, and promotes adaptive problem-solving. The cycle has four repeatable elements: Plan what to do, Do the work, Reflect on and learn from the work experience, Evaluate results. While a formal process, timelines and measurements for the cycle could be established for a particular group project or task, the cycle can also be observed and used informally and ad hoc. This may entail nothing more than the facilitator acknowledging that what the group is proposing to do, or is doing, or might consider doing, follows this cycle process, and what is or might be entailed in each of the four steps in the cycle. It may then be appropriate to have the group check in regularly to ensure the cycle is working. The pause between stages of the cycle is critical. It needs to be deliberate and acknowledged, since different strengths, skills and parts of the brain are involved in each. Also, some participants will inevitably be better at some stages than others, or more engaged by some stages than others. It may be difficult to squeeze all stages into a single group session, so it can be important to note where in the cycle a session leaves off, so no stages are skipped as the group separates and reconvenes. Indeed, some stages may even be best done individually between group meetings, in which case time must be set aside to capture and share what has happened since the last meeting. For example, research work may be done between sessions, and when the group reconvenes the results of the research may be tabled and reflected on before further action is taken. When the cycle is applied over time it can enable group participants to become more diligent and practiced at listening to each other. Questions can often prompt the most appropriate reflection. Rather than rushing to the evaluation stage, questions that foster open reflection can open new avenues of thought and action, and better collective appreciation and understanding of what each member of the group can offer at each stage of the cycle. We are conflict-avoidant so using this approach can allow us to reflect and confront any potential conflict issues rather than glossing over them. Facilitators and groups need to allow sufficient time for people to both act and reflect, which is very difficult in a single time-bounded session; if the reflection is cursory it will not inform the next cycle of action effectively. Sue Woehrlin was part of a work team that kept escalating in dysfunctional way; the group added a pause to allow regrouping with a bell to signal the transition interval between action and reflection to resolve this dysfunction. Dan used a biofeedback presence exercise applying Reigeluth's elaboration theory (http://www.learning-theories.com/elaboration-theory-reigeluth.html) - this allowed the group to learn from its experience. Don Klein's Simu-Real (http://www.relational-constructionism.org/pages/related-methodologies/la...) uses deliberate "stop actions" to structure formal reflection on progress and purpose. Simulations with role reversals (stop, reverse roles, think/learn) can help participants reflect on others' actions and perspectives. Most performance evaluation processes are a form of Action/Reflection cycle. 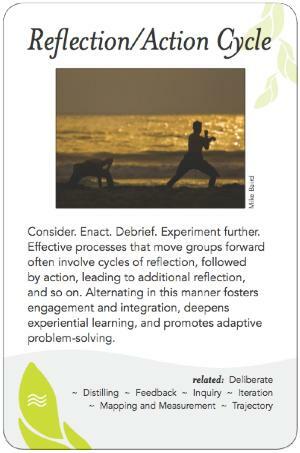 Donald Schon's -- the reflective practitioner "professionals learn to dialogue with their experience"